It was a bit of a shock when John Carmack, who co-founded the company, left Doom creators id Software in November. Until now, we didn't really know why. Turns out that the reason he and the company he helped build parted ways was because of virtual reality, specifically the Oculus Rift headset. And the fact id's owners, ZeniMax, weren't as passionate about it as Carmack was. Carmack - long a champion of virtual reality in video games - had visions of id's upcoming games like Wolfenstein and Doom 4 being some of the first AAA Oculus Rift games, supporting it out of the box and helping to sell the tech (and id along with it). He'd even taken up a second job of sorts last year, working at both id and Oculus Rift. But his attempts to bring the two together weren't supported by ZeniMax, Carmack says, which ultimately led him to choose one over the other. 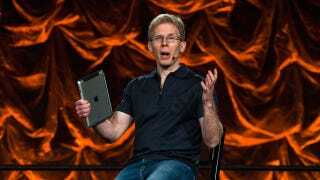 "When it became clear that I wasn't going to have the opportunity to do any work on VR while at id software", Carmack tells USA Today, "I decided to not renew my contract."